MOOCs could be disastrous for students and professors. Widespread online-only higher ed will be disastrous for students—and most professors. 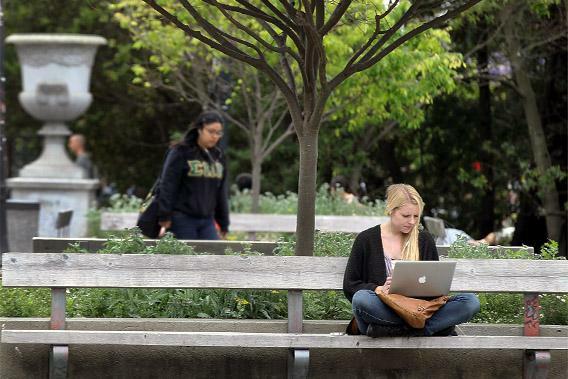 A UC–Berkeley student works on her laptop. Are online courses really the future of higher education? MOOC stands for “massive open online course.” The term was coined by a group of Canadian academics in 2008 to represent a recently invented type of online class that depends upon small group interactions for most of the instruction. More recently, three instructors in the Stanford University computer science department appropriated that term to start two separate private education companies, Udacity and Coursera. Despite being free of charge, the MOOCs that these firms offer bear a more-than-passing resemblance to ordinary college classes—except they are delivered over the Internet to tens of thousands of people at once. How do you teach tens of thousands of people anything at once? You don’t. What you can do over the Internet this way is deliver information, but that’s not education. Education, as any real teacher will tell you, involves more than just transmitting facts. It means teaching students what to do with those facts, as well as the skills they need to go out and learn new information themselves. But the most common way to assess learning in the MOOCs offered by the largest providers is a single multiple-choice question after approximately five-minute chunks of pre-taped lectures. If I had told my tenure committee that I taught history this way, I’d be in another line of work right now. Anyone who has the slightest interest or expertise in education would never teach this way, even if they were paid to do so. Despite the obvious problems with assessment, some of the best-known faculty at big-name universities across the United States and around the world have decided to become “superprofessors,” the people whose names are attached to these MOOCs because they do most of the lecturing. While very few of them have publicly discussed the compensation that they may or may not receive for their services, my guess would be that most superprofessors became superprofessors because the chance to become higher-education rock stars got the best of them, as the ones willing to talk publicly about compensation are making little or nothing. Unfortunately for everyone else in academia, their fame will likely come at a very steep price. From an administrative standpoint, the beauty of MOOCs is that they provide an easy opportunity to drastically cut labor costs by firing existing faculty members or simply hiring poorly trained ones—whom they won’t have to pay well—to help administer the class. After all, this way of thinking goes, why should I hire a new Ph.D. when I can get the best professors in the world piped into my university’s classrooms? Just asking that question is an insult to dedicated faculty members at universities everywhere. The answer is easy to anyone who understands how real education works. Local professors answer their students’ questions while superprofessors are, as one recent New York Times op-ed put it, “only slightly more accessible than the pope or Thomas Pynchon.” More importantly, local professors can offer their students the kind of personalized education that no massive course ever can. Ask any superprofessor why he or she decided to get involved in MOOC and you’ll probably hear a long speech about improving access to higher education. Daphne Koller, one of the Stanford professors behind the MOOC provider Coursera, gave a much-viewed TED talk that centers almost exclusively on the tragedy of higher-education deprivation in the developing world. Her evaluation of the extent of that problem has been forcefully challenged by Jon Beasley-Murray of the University of British Columbia. Whichever side of that dispute is right, the cynicism of focusing on access to higher ed in the developing world when one-third of student loan borrowers in the United States never even finish college simply boggles the mind. Talking about access to higher education allows MOOC providers like Coursera to avoid discussing the effect their services will have on people who work in higher education now. Professors, believe it or not, are people, too. They have families and health problems and student loans of their own. Moreover, three-quarters of American college instructors work on a contingent basis, for a median income of $2,700 per course, often without benefits of any kind. Since these faculty members also have no chance at tenure, these adjunct faculty members would be by far the easiest professors to replace with MOOCs. What makes this possible is that MOOCs, at least from an educational standpoint, are designed to run themselves. The lectures are pre-recorded. The grading is done either by computer or by other students in the class, should they choose to do the assignments at all. The average drop-out rates for existing MOOCs is about 90 percent, so while Coursera may offer access to higher education anywhere in the world where potential students can get the Internet, it offers no guarantee that anybody will actually learn anything. While providing a free education to the world is a noble thought, there’s very little money in it. The MOOC providers’ profits, if they ever appear, will come from creating replacements for existing college classes. I think it’s time for us non-superprofessors to forcefully explain to our newly famous colleagues how their MOOCs are already adversely affecting the terms and conditions of our employment, and are likely to do so even more in the future. The San Jose State University philosophy department has already offered up an extraordinary example of how this might be done in an open letter to the Harvard superprofessor Michael Sandel. The rest of us have much more similar work to do. For those of you outside of academia, I would ask only that you not take the kind of higher education that you may have had for granted any longer. Somewhere right now, private companies, university administrators, and/or politicians are already planning an all-MOOC future for most of tomorrow’s college students. Unlike today’s MOOC participants, these future students will have to pay for access to them. Only the most privileged students will still have in-person access to highly qualified professors. Also in Slate, Gabriel Kahn writes about Georgia Tech’s plan to offer an online master’s in computer science.